Changing his name to wright is the best indicator that he is sociopath and needs a long time out. And Judge Barry buys into it. Can’t wait to hear the for right sentence. 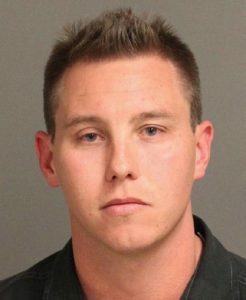 A former Pismo Beach police officer will face 30 days in County Jail and three years of supervised probation for removing ,1,562 from a police evidence locker. Robert Houston Petetit, a 15-year veteran of the Pismo Beach force, was found guilty of grand theft in a judge trial Dec. 11. He was found not guilty of a second charge, theft of public funds, a felony. Superior Court Judge Barry LaBarbera handed down the sentence Thursday. Guess whos dad this is. Apple doesn’t fall far from the tree. All with a 100%+ lifetime pension still intact. It appears based on some digging that Robert Houston Petetit is now known as…. Robert Wright. Also the same record that lists Robert Wright as being actually Robert Petetit returns a Medford, Address at some time in the recent past. His prosecution for the offense you listed was in 2003. So perhaps he moved to Oregon and it’s the same guy. That guy right there is the definition of a PUNK, scared little man with daddy issues who preys on women and elderly. He will get what is coming to him. Ad to the list of stories GUARANTEED not to run in The Fribune. Just sell the building, who are you kidding? KSBY is my breaking news source, the New Times for features and somewhat investigative journalism, and CCN for the unfiltered what’s going on. Looks like team hill is at it again! Anyone involved should petition this criminal’s name change and petition the federal court to get involved policing this ongoing abuse of the legal system. The lawyers of the abused can easily show the conflict of interest of the business partnership of Adam Hill and Ryan Petetit and the friendship of Adam Hill and the judge.